If you read the book of Revelation and find your head swimming in weird images and confusing timelines, then The Book of Revelation for Blockheads is for you. This engaging, lighthearted, and user-friendly guide gives you a chapter-by-chapter explanation of this often misunderstood yet important book of the Bible. Description: ^Getting a glimpse into the future is always intriguing, especially when that glimpse comes from God's Word. But let's face it, the book of Revelation has some pretty weird stuff in it: seven-headed beasts, locusts with gold crowns, a city coming down from the sky. What does it all mean, and how does it help you in your Christian faith? This lighthearted yet accurate guide to the last book of the Bible will help you overcome the confusion. Engaging and user-friendly, The Book of Revelation for Blockheads helps you: Understand the message of this often misunderstood book chapter by chapter Discover what Revelation says about how end-time events will unfold Make sense of all the symbolism See how Revelation relates to other parts of the Bible Learn how others interpret controversial parts Worship God with a new vision of his glory and ultimate triumph, and of what that means for you. 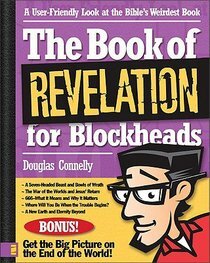 About "The Book of Revelation For Blockheads"
Douglas Connelly is the senior pastor of Parkside Community Church in Sterling Heights, Michigan. He is a graduate of the University of Michigan-Flint and of Grace Theological Seminary (Master of Divinity, Master of Theology). He has also been an adjunct instructor at Spring Arbor College. He is the author of numerous Bible Study booklets and books including The Book of Revelation for Blockheads; Amazing Discoveries That Unlock the Bible; The Bible for Blockheads Revised Edition and Bible Prophecy for Blockheads. Unavailable. This item is being reprinted. There will be a delay in fulfillment of your order. eBook is Available.